Welcome To The Staley Strategies! - Welcome To Staley Strategies Online Fitness Coaching! Home » Miscellaneous » Welcome To The Staley Strategies! Welcome To The Staley Strategies! Hey guys, it’s May 8th and I just launched a new website! I thought I’d kick things off with an inaugural post just explaining just a little bit about me, this website, and how all of that might relate to you and your goals. First, I am not nor have I ever been a “natural” at this stuff. At 18, I weighed 135 pounds at my present height of 6’2”, and believe it or not I wasn’t remotely lean even at that bodyweight. Nor was I strong or athletic in any sense of the word, despite having a passionate interest in all things physical. Thankfully, I seem to have blacked out most of the humiliating incidents that took place in my early athletic endeavors, but I do remember things like getting pinned under a 95 pound bench press, and also being decisively submitted by my friends sister in a backyard wrestling match – that was after about six years of martial arts training by the way. So long story short, my athletic beginnings were humble to say the least (More about my personal history HERE). Oh, and I should also mention that I have no injuries to speak of. I don’t hurt anywhere, and with any luck it will stay that way. Do older guys need more protein than younger guys? Is occlusion training really a thing, and should we be using it? 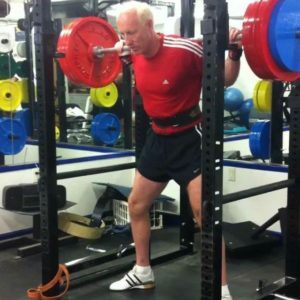 Are heavy deadlifts and squats advisable over the age of 50? What proportion of strength VS hypertrophy training should I be doing? Should I be running/jogging, and if so, how will that affect my strength levels? Should I consider testosterone replacement therapy (TRT)? What’s the best approach to mobility development? Is ketogenic dieting a valid approach to fat loss? Can I/should I continue to train on a knee replacement, and if so, how? Am I too old to do my first powerlifting meet? Now needless to say, I’m not going to be everyone’s cup of tea, and I don’t expect to be. 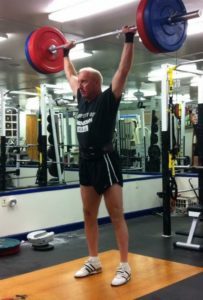 So if you happen to be a 60 year old guy who can deadlift 600 for 10 reps and you are 265 pounds at 8% body fat, you probably won’t find me terribly inspiring (incidentally, if that’s you, I find YOU terribly inspiring so please send me a note so I can learn from you!). But, if you’re a guy in your 40s, 50s, 60s, or beyond, and you’ve struggled with developing the physical traits and fitness levels that you’ve always wanted, I know you’ll find Staley Strategies a valuable community to be a part of. The first thing to do is sign up to our email list (it’s at the upper right-hand part of this page) so that you don’t miss any new content or announcements (later this year, one of those announcements will be about my new book that I’m currently working on). Secondly, we all learn from each other in this game, and so while I might be the figurehead of this gig, all of you have enormously valuable insights and experiences to share. As we go forward, I want to hear from you – your victories, your struggles, all of it. Thanks so much for your interest, and if you’ve got questions, comments, or suggestions, I’m all ears — please leave your feedback below. Thans Shib — take care of that arm and please keep me posted!